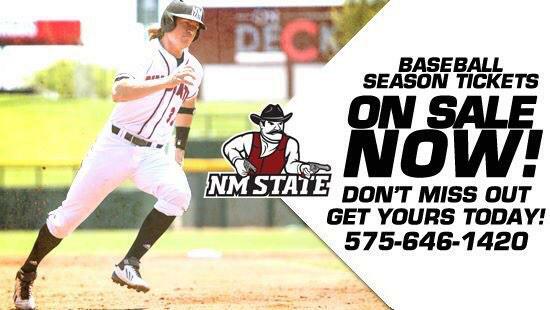 LAS CRUCES, N.M. (July 18) – New Mexico State head softball coach Kathy Rodolph is hosting four fall individual camps and one winter team camp before the start of the 2015 season. The All Skills Camp is set for Aug. 10, the Free Camp is set for Aug. 16, and the two prospect camps are set for Sept. 6-7 and Nov. 1-2. The skills and prospect camps are open to grades 9-12, while thw free camp is ages 10 and under. The team camp, set for Jan. 10-11, is open to teams age 10-12 and high school teams. Each camp is held at the NM State Softball Complex. The fall All Skills Camp is $25 and each camp is limited to 50 participants. The two prospect camps range from $125 for a single day or $200 for the two-day camp. The Team Camp is $400 for a team of 10-15 players. Individuals may sign up for a smaller fee. The All Skills Camp gives players the opportunity to get back into the game, honing in on defensive and offensive skill sets for the new year. Instructional work will include infield skills, outfield skills, throwing mechanics, hitting techniques and more. The Free Camp gives participants the opportunity to learn the fundamentals of the game including: hitting, throwing and base running. The prospect camps are structured to give players the opportunity to showcase their abilities and work with the NM State coaching staff. Instruction includes speed, base running, proper throwing, hitting and pitching techniques and defensive work. Scrimmages will take place in the afternoon of each day. The Team Camp, Jan. 10-11, is designed to help teams get ready for the 2015 season. The focus will be on practice organization, defense and pitching and hitting progression drills. For more information on the camps and to register, click HERE. Description: This All Skills Camp is a great way for players to get back into the game, honing in on offensive and defensive skill sets as the new school year rolls around. Instructional work will include infield skills, outfield skills, throwing mechanics, hitting technique, and more. Description: Learn basic fundamentals of softball including: hitting, fielding, throwing and base running. Description: The Prospect Camp is an excellent opportunity for advanced players, grades 9-12 to showcase their abilities and work with our Coaching staff. Instructional workouts such as: speed, base running, proper throwing, hitting, pitching technique workouts and defense; scrimmages will take place in the afternoon. Description: The Team Camp is designed to get a jump start on the 2014 season. This will be an interactive environment where you can work with our Coaching staff as we demonstrate some of our most productive drills and strategies. Learn practice organization, defensive, pitching and hitting progression drills for all skill levels.